Fantastic Chuck. Such an elegant design too.... love it!!! Another great build shaping up Chuck!.....Can't wait for the first start! Here's a picture of the valve actuating parts. 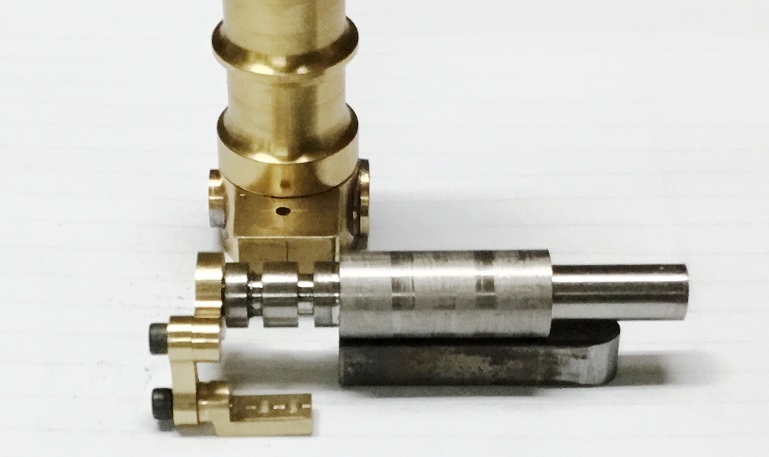 The larger piece is an arm that will attached to the end of the rotary valve and the smaller piece is a link which will connect the arm to an anchor screwed to the base. I've determined that the cylinder motion provides enough rotation on the rotary valve that I won't require an eccentric. These little parts are made a lot easier with CNC. I designed them in Visio and cut them out of a larger, captive piece of brass. Then they were separated from the captive piece by milling off the back side. Piece of cake. I've also cut the anchor piece but need to do a bit more shaping on it. Next I'm going to remake the rotary valve so the exhaust will be routed back into the cylinder pivot rod where it could be plumbed away from the engine, as suggested by Tug. Third fourth time is the charm as they say Chuck. Yeah, it would seem so. Some daye it just takes me a few tries to get my Sh*t together. Finally got the overall shape and size of the valve cut. The material is stainless steel, probably 304 as tough as it is to machine. Some daye it just takes me a few tries to get my Sh*t together. Regardless...perseverance and all that. It's looking great! It sure is!! And a rather unique mechanism as well. Very nice Chuck. This morning I drilled the inlet and exhaust passages in the lower cylinder block. The right one is the inlet and the left is the exhaust. Both holes are drilled all the way into the cylinder pivot hole. 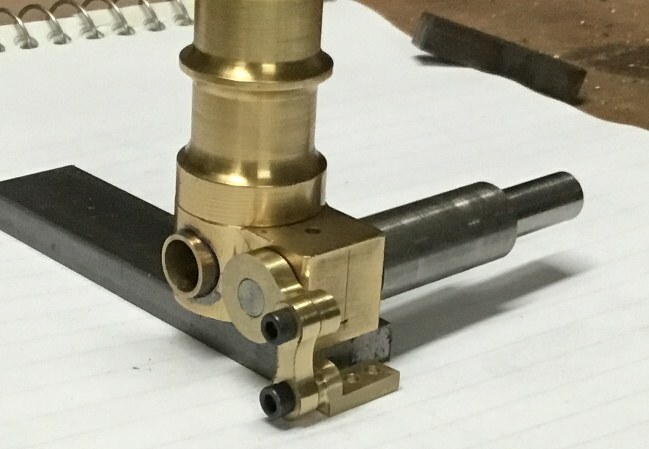 The cylinder pivot rod will have inlet and exhaust ports that line up with the holes in the cylinder block. 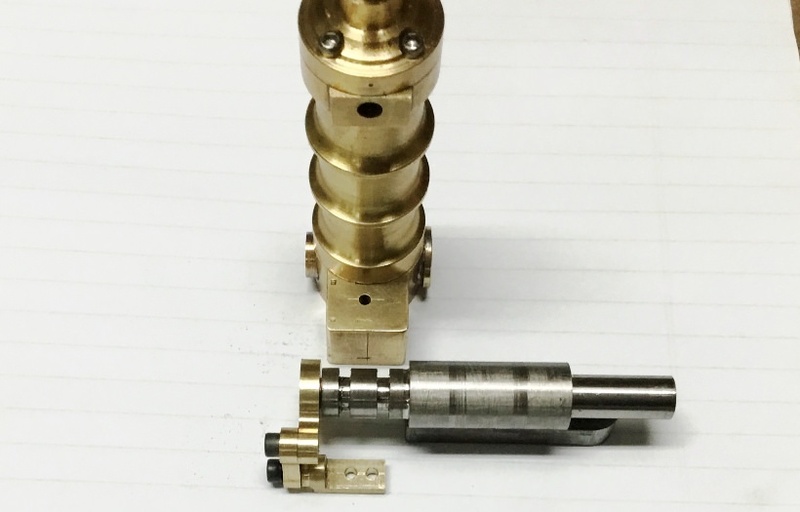 I've also milled the connecting slots in the rotary valve and parted it off from the parent material. I think now I'm ready to reassemble the engine and check out the valve movement and timing. I also need to move forward with drilling and porting the cylinder pivot rod. Coming together very nicely Chuck. 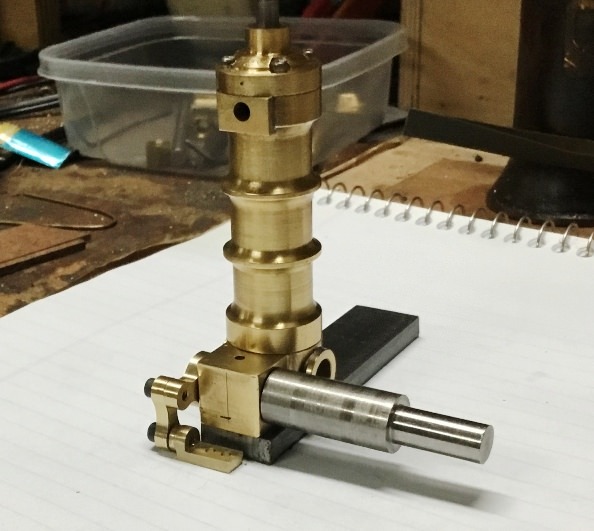 Quite a neat valve, looking great! I like the way you have been able to do away with the eccentric and I hope you get all that porting in without those initial fears of it leaking. I'm stoked! I'll have this engine running in a couple of days, maybe tomorrow! I finished all the valving and linkages. The only thing left is the plumbing from the valve chest to the top end of the cylinder. And... wait for it... I tested the engine and it runs, quite nicely, on just the bottom half of the cylinder. With the plumbing installed for the top end it should run very well in double acting mode. Saweet! Exciting stuff, looking forward to seeing it go! Bad Behavior has blocked 13712 access attempts in the last 7 days.